Imagine watching a movie while sitting on a couch that’s missing a cushion or taking a long car ride while sitting on a seat without cushioning. For many individuals who rely on the use of a wheelchair, this discomfort is common, particularly if they don’t have a supportive or comfortable seat cushion. Not only is feeling uncomfortable for long stretches a hassle, but it can affect the overall well-being of someone who uses a wheelchair. Anyone who has ever experienced discomfort or pain knows that it can affect someone’s demeanor. It’s hard to feel happy and relaxed, right? If someone in your life uses a wheelchair occasionally or all the time, and doesn’t have a wheelchair cushion, it’s time to help him or her find one. Even if he or she has one, it may not offer the comfort and support needed. We will guide you through the process of finding the best gel wheelchair cushions on the market. Aside from what we already stated above, a wheelchair cushion is an essential feature to any wheelchair. It should never be viewed as a luxury item, but rather as a necessity. Many wheelchairs, particularly non-power chairs, have a fold-up design for easier transport and storage. While this design is convenient, it doesn’t allow much support or comfort in the sling style seat. If you’ve ever used a wheelchair for a brief period, you probably remember how uncomfortable it felt. Anyone who uses a wheelchair is at risk of developing pressure sores. These sores can develop when bones press against muscle tissue, particularly over a long period of time without movement or repositioning; the longer the amount of time, the greater the risk. We often hear about pressure sores being an issue for individuals who are confined to bed, but people who use wheelchairs are not immune. Pressure sores are most likely to form on the thighs, on the buttocks, and in the area around the tailbone. In addition to preventing pressure sores, a wheelchair cushion can help to keep the spine in alignment and help provide better posture. Improper posture can result from a wheelchair is not adjusted correctly or due to other issues like chronic back or sciatic pain. Other benefits include reduced leg pain, less muscle strain, and feeling better overall (including mental health). When your body feels good, you’re likely to feel happier, too. Why Choose a Gel Cushion? A gel wheelchair cushion typically consists of gel that’s placed into individual pouches and attached to foam base, making it easier to conform to and support the body. A gel layer may be on top of a foam pad to allow for better body temperature control, or the gel may be distributed between layers of foam to help distribute support more evenly. Another benefit of using a gel cushion is that many cushions may have a weight capacity of up to 500 pounds, which can be ideal for individuals with a bariatric wheelchair. 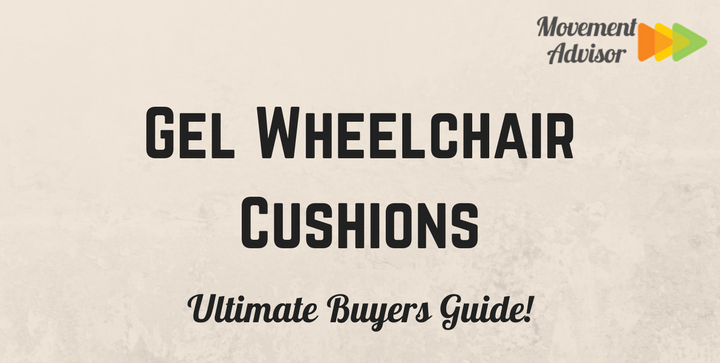 While gel wheelchair cushions have the same basic design concept, there are many different kinds on the market. Before you purchase the first one you find, there are important factors to consider. Doing a little research and some careful consideration is likely to make you happier with your purchase. Just as wheelchairs come in different sizes, so do gel wheelchair cushions. Buying one that’s too big or too small will not help to make the seat more comfortable than it already is (in some ways it could feel worse). Don’t buy a larger one with the idea of cutting it to size; this can ruin the stability and function of the cushion. You can either measure a wheelchair cushion that is already in use or take some quick measurements. To measure the seat width, measure from one outside edge of the seat upholstery to the other. For seat depth, measure front to back along the side rail. Always measure more than once for accurate dimensions. Although many gel cushions are designed to have a weight capacity of 500 pounds, not every cushion will hold up to that weight. Select the right cushion for the individual’s weight category. If an individual, who weighs 300 pounds, uses a cushion with a weight capacity of 200 pounds it may feel comfortable for a short period, but the cushion is not likely to last long. Rather than purchasing one cushion after another, buy one that fits an individual’s body type. There are plenty of bariatric gel cushions on the market; you should be able to find at least one that will be a great fit. Maybe you have noticed that some gel cushions are flat and others have a contoured design. These design features are not only for personal preference but also have a lot to do with mobility and positioning needs. If the individual, who uses a wheelchair, can move his or her body freely and with minimal assistance, a flat gel cushion will probably offer enough comfort and support. If he or she is unable to move unassisted, a contoured design will provide more support and help maintain a good posture for a longer period. Whether an individual can move independently or needs help, sitting all day in a wheelchair (regardless of the wheelchair cushion quality) is not necessarily beneficial to health. Movement and repositioning are always a good idea. Gel wheelchair cushions are often heavier than the other cushions on the market, but it’s important that you choose one that will be secure. For example, a cushion with a non-skid bottom may not work as well as one that has straps that secure to the chair. Again, it depends on personal preferences and needs. A wheelchair cushion should be easy to clean or at least have a cover that is washable. Some individuals, who use a wheelchair, may have issues with incontinence or may experience excess sweating. Cushion covers should be made of a breathable fabric, and the cushion should be waterproof, especially if it contains foam parts. One thing that many people overlook, when buying a gel wheelchair cushion, is checking out a return policy or warranties. Some companies will offer a warranty or have a 30-day return policy and others will not. Depending on the policy, it’s even more important to make sure you measure the cushion correctly and take your time in selecting the right one. Like many gel wheelchair seat cushions, this cushion design redistributes pressure and prevents pressure sores. It is also suitable to use when treating and managing a pressure sore. The gel bladder is encased in a fire-retardant foam, which provides extra comfort and support. The top four sizes have a weight capacity of 275 pounds, and the remaining two have a weight capacity of 500 lbs. Similar to other gel cushions, this is combined with foam to provide optimal pressure relief, improves weight distribution, and prevents skin irritation. The cushion cover is a waterproof poly-cotton blend and can be removed for washing. The bottom of the cushion has a non-skid material and has Velcro straps that attach the cushion to the wheelchair for added security and stability. The dimensions of the cushion are 18” W x 16” D x 2”H and the weight capacity is 250 pounds. This gel wheelchair cushion is a little different than some of the other cushions on the market. The gel sections are raised at the buttocks and rather than foam, the gel is cushioned between breathable and cooling mesh fabric. The cushion design is for tailbone and coccyx pain relief, which can allow someone to sit longer in a wheelchair. The cushion is portable, foldable, washable and easy to carry. The dimensions are 13” L x 16” W x ⅞” H. Although this cushion may not be suitable for long periods of time, it provides comfort and support for shorter periods of time.